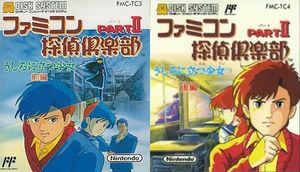 Famicom Tantei Club Part II: Ushiro ni Tatsu Shōjo (ファミコン探偵倶楽部PartII うしろに立つ少女) is a text adventure. As a young detective (whom you name yourself), you work as an assistant for the famous investigator Utsugi. Your first important assignment is to investigate a murder case. A girl named Yoko was found murdered near a central bridge. During the investigation, you discover a strange rumor about a mysterious ghost-like "girl who stands at the back", spread around the school Yoko studied at. Soon the young detective realizes that the case grows more and more complex and that he will need all his wit and talents to find the criminal! The graph below charts the compatibility with Famicom Tantei Club Part II: Ushiro ni Tatsu Shōjo since Dolphin's 2.0 release, listing revisions only where a compatibility change occurred. This page was last edited on 4 March 2018, at 03:11.